Fun and flexible, Filtatron is a great iOS audio processor. Great Moog sound. More than just a filter. It's not a mobile Moog synth. 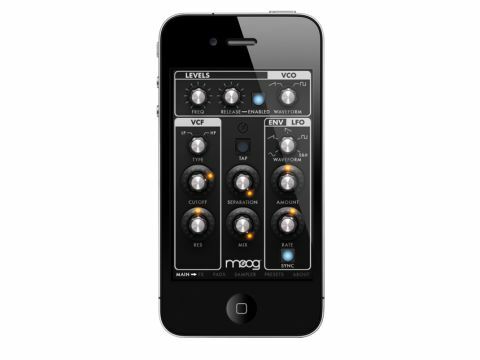 You know iPhone music apps are getting serious when even hardware synth legends Moog are after a piece of the pie. Its app, Filtatron, isn't a straight-up synth, however. Instead, you use it to process audio from three sources: the mic input, a sample player or an analogue-style oscillator with blendable saw/square shapes - you get level knobs for each of these inputs, so you can use all three at once, if you like. These signals are then pumped through a stereo Moog ladder filter with low-/high-pass mode, cutoff, resonance, separation (stereo offset of cutoff frequency), and dry/wet mix controls. You can twiddle the cutoff manually or use an envelope follower and LFO to modulate it. The latter has tempo sync (set it with the Tap button) and five shapes via a continuous knob, so you can smoothly move between them. That's the main page in a nutshell, but there's more. On the FX page, there's filter overdrive and feedback alongside a tempo-syncable tape-style delay with a simple time-modulating LFO. The Pads page, meanwhile, offers dual X/Y pads for controlling parameters in real time. Filtatron's sound quality is superb, and it's easy to forget that you're using an iPhone app and not a desktop plug-in (actually, we'd love to see a plug-in version!). The filter can go from a bassy thud to all-out resonant whistle, and the drive/feedback options offer plenty of textural variation and wild behaviour. The oscillators sound warm and 'analogue', while the delay is itself a prime source of sonic madness. Just crank up the feedback and start manhandling the delay time - it sounds very smooth and can even churn out pseudo vocoder and old-school timestretching effects. Using the mic input to manipulate real-world sounds is fantastic fun (especially in a public place using headphones! ), and all of your mayhem can be recorded to WAV. There's Audio Copy/Paste for bouncing sounds back and forth with apps like NanoStudio, which facilitates the use of Filtatron to jazz up staid sounds. Further niceties include a built-in manual and synthesis glossary, a Moog product catalogue and FTP file transfer. While not being essential, Filtatron sounds superb and is a ton of fun. We can't imagine anyone being disappointed with it.